Utility to modify file-folder properties: date-time, attributes, EXIF metadata, properties of MS Office documents. It can copy properties, shift date/time stamps, modify only part of date or time, change dates sequentially and much more. You can also modify text properties: copy them, perform CaSE conversions, replace substrings. 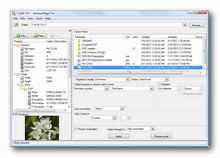 Utility can manipulate file names and rename files with date-time. Simplified version of an AttributeMagic Pro. Works only on regular files and folders. Utility can alter date-time stamps and attributes of files and folders, rename files with date-time data. 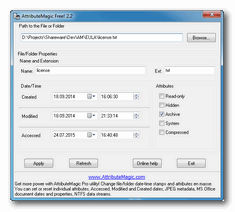 Contains same powerful date-time modification features as an AttributeMagic Pro. Provides reusable templates and file filters. Special release of AM-Pro. Works only with MS Office documents and files/folders. Utility can manipulate metadata of MS Office documents and change properties of files. Powerful date-time and string manipulation features. 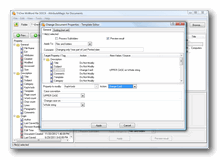 File reanaming features, custom templates, file filters, directory printing, command line mode. 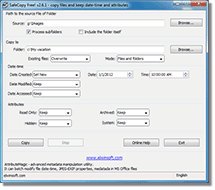 Free and portable utility to copy files, folders and preserve date-time stamps and attributes. This tool can duplicate a folder structure without copying files. Command line mode. SafeCopy Free! v2.6.1 released. New command line options. Minor interface improvements. SafeCopy Free! v2.6 released. Localization added. SafeCopy Free! v2.5 released. New option added, bugs fixed, improved error messages. SafeCopy Free! v2.4 released. Now with command line option. Bugs fixed.